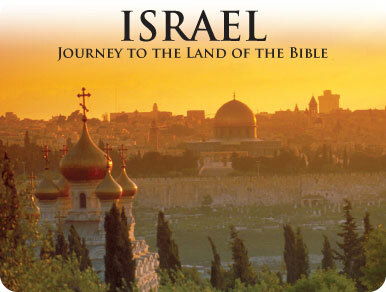 Immerse yourself in the land of the Bible. Walk in the footsteps of prophets whose teachings of Judiasm, Christianity and Islam will come alive. Revel in the magnificent scenic beauty, fascinating culture and bountiful history on a journey through the ancient land of miracles. • Spend time at the Kibbutz Ein Gev with a tour of the working area. • Visit Bet She’an – see the remarkable excavations of a former Roman city. • Full-day tour of Jerusalem—Mount of Olives, Church of the Our Father Who Art in Heaven; Garden of Gethsemane, Basilica of Agony and Tomb of Mary; the Old City including the Four Quarters, Via Dolorosa, the Western Wall and the Cardo. Today our journey begins to the Holy Land where we will walk in the footsteps of the prophets. Here, in the land of miracles, the stories of the Bible will come alive in the home of Judaism, Christianity and Islam. Our drive this morning begins at the Mount of Beatitudes where Jesus blessed his disciples 2000 years ago. Here we see the church of the same name designed in an octagonal dome that represents the 8 “Beatitudes.” We continue on to Tabgha and the Church of the Multiplication of Loaves and Fishes the site of the miracle of the Christian Savior who fed 5000 starving people with two fishes and five loves. Also along the Sea of Galiliee, we see the Mensa Christi – Church of the Primacy of Peter. Here Jesus elected Paul as his representative on earth and also performed the miracle of telling fisherman to cast their nets on the other side of the boat. We continue on to Capernum and then visit the working area of a Kibbutz. Following a St. Peter’s fish lunch we sail across the Sea of Galilee and, after a short drive, we arrive at the Yardenit Baptismal Site on the Jordan River where baptisms are performed today.